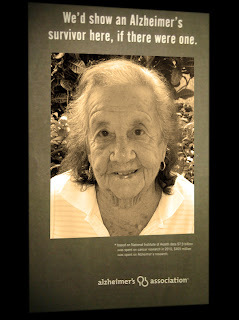 When I saw the image of the objectionable Alzheimer’s ad, newly adorned with Dotty’s familiar picture, I felt hopeful and inspired and energized. Did Dotty survive Alzheimer's? Oh yes, indeed. Dotty certainly did. She lived a life so completely contrary to the common expectations conjured by the word "Alzheimer's". She survived the diagnosis, the dreadful word, and continued to live, to imagine, to love, to sing and enjoy her good fortune. She managed all that, and lived a good, long life despite being saddled with the complications imposed by disease in her later years. Though she had a disease, she wasn't only her disease. She was wonderfully, beautifully, authentically human until she drew her final breath. The Alzheimer’s Association used this stark slogan as part of an advertising campaign. The blank space below the slogan evoked the strong and unsettling emotions that help raise money: fear, hopelessness, despair, guilt. Yet in some of us, it also brought forth an angrier reaction. For me, it seemed that the organization had forgotten the very people it ought to put first. If any part of its objective was educational, then the Alzheimer’s Association failed miserably. People live, and some live well, even when they’ve received that dreaded diagnosis of dementia, probably of the Alzheimer’s type. In short, they survive. Let’s not lose sight of the support needed by the survivors – our loved ones tend to live quite a while with their disease. Don’t erase their faces from our consciousness. 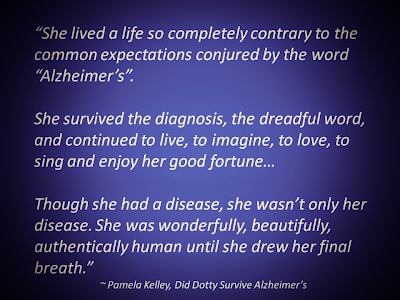 The idea that there are no Alzheimer's survivors is offensive to many dedicated to the care and comfort of the deeply forgetful because we see our loved ones living their lives, much as Dotty did -- engaged in the process. We know that Alzheimer's alters lives, theirs and ours. We come to know that we can continue to live our lives together, and find satisfaction and joy in doing so. When they suggest that Alzheimer’s is a black hole from with nothing emerges once touched by its pull, the Alzheimer’s Association fuels an unwarranted stigma that compounds the burdens our loved ones bear. In a way, it encourages the focus to shift from the individual -- why bother with them if there’s no hope – to the aggregate need for money for research and drug trials and advocacy groups. 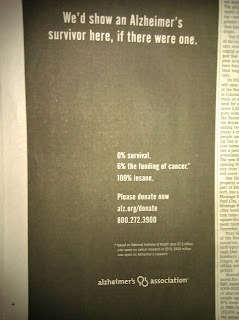 This isn’t to suggest that there isn’t a brutal need for funding for research. Obviously, the need should not be denied. But when your family is touched by Alzheimer’s, your need is much more immediate. You need to know that you’ll survive the experience of Alzheimer’s – that doors won’t slam shut, that people won’t disappear, that communities won’t exclude you. Fear and hopelessness, like that which is evoked by that ill-considered advertisement, is what slams doors, sends people running and justifies exclusion. It fuels the isolation of those afflicted as well as their caring partners. And that isolation is a tragedy. 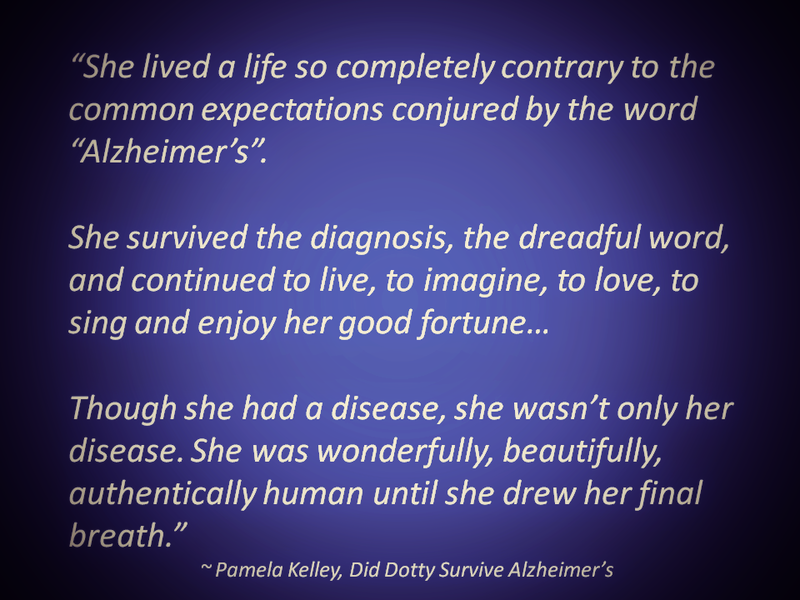 How much better to illustrate the Alzheimer’s Association advertisement with Dotty’s beautiful image. To those struggling to adapt to this disease, how much more beneficial to learn what Dotty and Bob DeMarco accomplished as care partners experiencing this chronic disease. Their example of what could be has served to galvanize many of us who read The Alzheimer’s Reading Room every day. It helped. It helped in the present, here and now, day after day. This is the picture of what can be – provided that a care partner or caring community is brought into the equation. This kind of survival is possible, with major commitment and effort and support. What do we need to do to eliminate barriers to that kind of commitment? I’d like to see the policy makers address that question. Meanwhile, I’m hanging onto this image of Dotty, an Alzheimer’s survivor. It helps me renew my daily commitment to helping my own mother survive too. Title: Did Dotty Survive Alzheimer's?